Oh Hey, I’m Running a Half Marathon This Weekend! Lately, 99.9% of my posts on this blog have been about Delaware – my training, my goals, you get the picture. I’ve been super focused on the marathon myself, but in the back of my mind, I’ve been starting to get excited for Augusta – half marathon #13 and state #10. I absolutely love to race, but I haven’t really done any big races since the Bay State half in October. Since then, my mom and I registered for Delaware and set some pretty lofty time goals for ourselves. Obviously, Delaware is our main focus, so we aren’t doing a real taper going into this half marathon, although I will be trying to take it a bit easier on my runs this week. 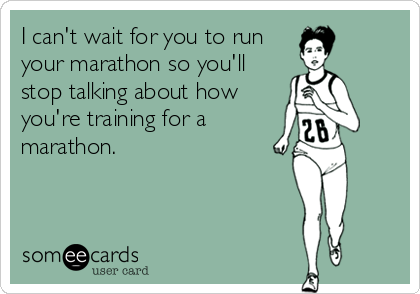 So what exactly are my goals for this half marathon? My number 1 goal is to run a PR, which I think I should be able to do easily based on how my training has been going (a PR would be anything under a 1:48, or 8:16/mile average pace). When I first got into running longer distances, I always had the mentality that I should take it slow on long runs – if I tried to run too fast, I would bonk for sure. And that was probably true when I first started, but I’ve come a very long way since 2012. I’m finally beginning to realize that I can actually race a 10+ mile race – it isn’t easy, but I won’t die or completely fall apart at the end. My number 2 goal is to run an average pace that is faster than my goal marathon pace (so anything under an 8:05). If I want to be able to hold an 8:05 (relatively) comfortably for 26.2 miles, then it makes sense that I’d damn well better be able to run faster than that for a measly 13.1 miles. I think the elevation profile of Augusta is also in my favor – yes, that is a bit of a scary hill from mile 6-7, but other than that, it’s pretty dang flat. Just for reference, here is the elevation profile from my 13 miler this past weekend from the MapMyRun data. I couldn’t set it to the same scale as the other elevation profile, but I think it shows the general picture – this run had WAY more hills, but I was still able to run it in under 2 hours and I felt decently comfortable the whole way. Goal #3 is the more intimidating one. In a perfect world, I’d like to run a time that reflects that my marathon time goal is within the realm of possibility, if only for the sake of my confidence and mental sanity. I fluctuate between feeling like a BQ is totally within my reach and feeling like there is no freaking way it’s going to happen. I know I have a tendency to surprise myself by running faster at races though. So that’s why I have a few scheduled in the calendar leading up to Delaware, and I think these will be the real indicators of what I’m capable of. 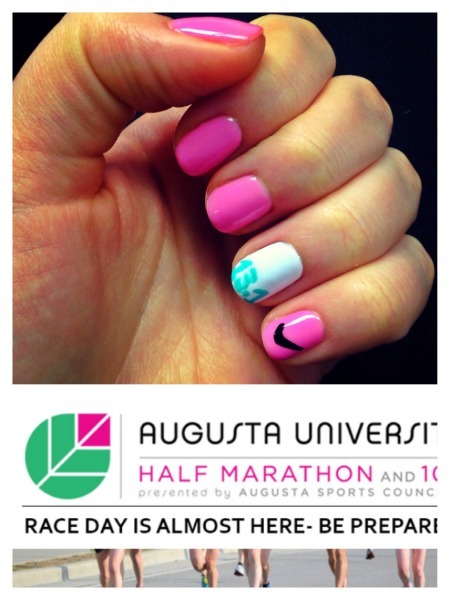 Augusta is the first of these races, so it feels a little more significant in a way. I know it’s going to be a really fun weekend, no matter what time I end up running, and I’m really just excited for another race adventure. GOOD LUCK THIS WEEKEND! I love your goals. I think all of your goals are very attainable and you are going to fly. And you know me and manicures – OBSESSED – I LOVE YOURS. OMG. Sending to my sissy in law ASAP as I have a date with her Sunday for a fresh mani!